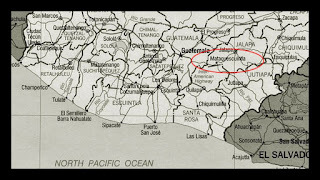 Inexplicata-The Journal of Hispanic Ufology: Guatemala: A UFO Crash at Mataquescuintla? Within the UFO phenomenon, saucer crashes have a special halo. The best one of these is the one that took place in 1947 in Roswell, New Mexico, but as time goes by, new cases emerge which still amaze us, and this is the episode which we shall analyze in this section. It occurred in the small country of Guatemala and is confirmed by the information in our possession. The main witness – Mrs. Maria Candelaria Hernández – was around 74 years old at the time, leading us to believe that the incident took place between 1938 and 1939, making it one of the oldest UFO crash episodes known. 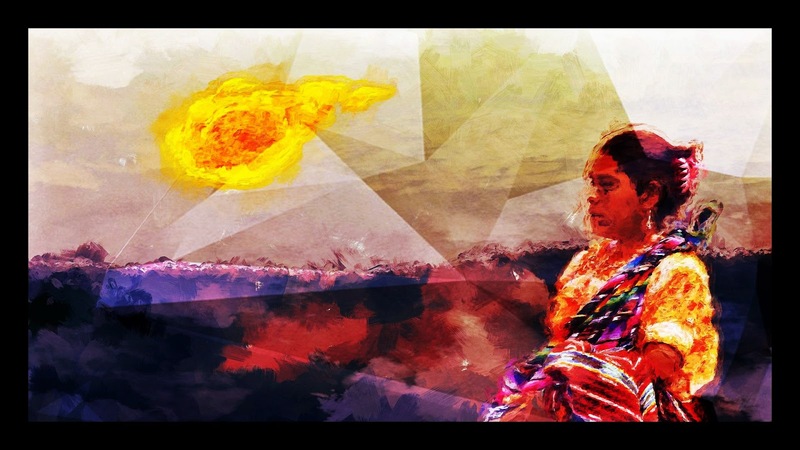 The witness told her son Pablo the story of some strange events that took place in a property near her home, specifically the “La Concepcion” farm, now owned by Mrs. Antonieta de Braun and which has been in her family for generations. A child of Pablo Hernandez told the story in 1983 to Guatemalan UFO researcher Oscar Padilla, who made the necessary verifications to vouch for the case, with very solid grounds for believing it was real. Mrs. Candelaria was washing laundry in one of the water pools known as Las Charquitas when she heard a deafening roar. Looking to the sky, she was startled to see a fireball speeding past. This incendiary mass flew over the cypresses in the area, and she noticed that the trees shook by the air displaced by the bolide’s passing. Despite the strange statement by the boys, her tiredness and the burden of the freshly washed laundry, made her desist. She set upon the long trail that would lead her back home. On the next day, Mrs. Candelaria woke up early to prepare corn tortillas for breakfast. Despite the fact that nothing ever happened in her town, she heard rumors that many people were heading toward the cypresses where she had seen the fireball go down. She noticed that most of these people were soldiers, policemen, farm security and some “gringos” who were not known in the area. The police chief took the metal box, going away with other law enforcement officers and some Americans who accompanied them. Mrs. Candelaria still remembered the frightened expressions on her relatives’ faces when they looked into the aluminum box. This, then, is the summarized and transcribed story of the statements made by Pablo Hernández, Doña Candelaria’s son, who perfectly recalled the story his mother told him, and which stayed with him over the years. We have, of course, made certain adaptations to the eyewitnesses’ words and statements to make them more understandable and universal. But the essence of the story is correct. The information provided by Mr. Arnaldo Padilla Rojas is confusing, as he did not see anything. However, based on reports for locals who discussed the matter, an essential conclusion can be reached: throughout the investigation, it was possible to ascertain that “some sort of pact or sworn agreement existed among the locals to conceal this event.” Padilla Rojas also confirmed that in his youth, many people remarked that “some strange little men” had been collected from the site. Inquiries led to some new witnesses. This time it was Mrs. Tomasa Toledo de la Cruz, almost 90, with a very lucid and sound memory. This nearly centenarian woman at first denied that there was any truth to the rumors, but her daughter Fluvia Cruz de González indeed remembered that around 1979-1980 four people – claiming to be miners – reached the area looking for “a golden bell” which according to them was buried on the family’s property. A local legend of the time existed about a gang of brigands called “Los Lucios” who raided the area, and people used to bury valuable objects. Even so, the search by the so-called “miners” was not very convincing, since their excavations were disorganized and gave the impression of being a random search. Eyewitness María Hernández recalled that when she was 18 years old (being 74 at the time she was interviewed), before she married, thereby deducing that the event occurred 56 years ago, adding for greater precision that it could have been 1938 in the village of Morales. There were many witnesses to the object’s fall, which she openly calls a “flying saucer”, showing that the she would later associate it to later news items when the UFO phenomenon emerged. She added that locals would talk about how some “blonde midgets” would wander around the area. There was even talk in town about a female woodcutter’s disappearance – an event witnessed by the woman’s own son as he hid in the bushes. During the interview, Mrs. Hernández expressed her fear at the similarity between these midgets and what has been appearing recently on television and the news. For this reason, she adds, she tries not to dwell on the subject. The investigation went through the Department of Santa Rosa, Casillas, San Rafael de las Flores, and finally Morales, which is a village in Mataquescuintla. Inquiries determined that there are few people still alive from that age. Mr. Pedro Cano recalled that some 50 years ago there was much talk about the disappearance of a woman who had been kidnapped by a strange flying machine in the area. However, for every solid piece of evidence, one could also tell that the older folks consulted prefer to remain silent, giving rise to the reasonable suspicion that there was a mutual agreement that commanded their silence. The investigation led to the home of Mr. José I. Hernández and his wife, who confirmed all the accounts told by their old neighbors. Chance, ever-present, manifested itself when Victor Manuel Hernandez, the family’s son, better known as “Tito” locally and also known for his sad fondness for drink. During a moment of lucidity, he offered some information which proved to be fully coherent after analysis, and which proved that the scene of the events was very near to the house of witness Tomasa Toledo de la Cruz. Tito’s assistance was essential in locating the site. Perhaps by being misunderstood in a peasant environment, and to avenge himself on his own people, he led researcher Oscar Padilla along a narrow dirt road leading to a place known as “La Minita”. It was a sort of narrow path, filled with brambles and oilseed plants [whose thorns] pierced our socks, producing intense itching. The field was full of holes, and had certainly been excavated for a long time by others. The site, at the end of a river, was determined to be within the confines of the “La Concepcion” farm and old pools of water. It was, without question, the place where Mrs. María Candelaria Hernández saw an incandescent object fall into the nearby woods fifty years earlier, scant meters from a football field. Inquiries led us to confirm the existence of a pact of silence among the locals which made this possible UFO crash to go unnoticed. The story never reached the media, particularly due to this remote location, where isolation fosters robberies and all manner of misdeeds. This also served to conceal the facts. Subsequent inquiries had to be carried out with great caution, to the extent of requiring materials for self-defense and an all-terrain vehicle suitable for the rough roads in the area. It is clear that something indeed took place, and that a pact of silence between the residents and the authorities of those times existed. Was the object that fell from the sky buried? What is the reason for all the excavation activity where the object allegedly fell? Several local legends speak of a buried “local bell” - A folk legend or the assimilation of an actual fact that is about to become a popular tradition? The conclusions reached by Oscar Padilla suggest that the events were real, and he recently reaffirmed this belief when consulted by this author. 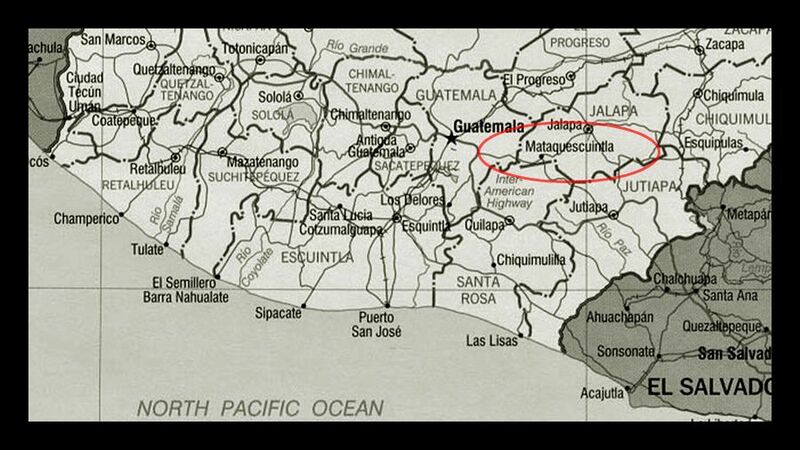 Mataquescuintla was in the news again in 2003, when Guatemala's Diario La Hora newspaper reported in its April 28 edition that a "strange object" had fallen from the sky, causing dismay among local residents. The strange device, resembling "an axle wrapped in nylon", landed in a coffee plantation owned by Luvia Cruz, setting fire to some of the coffee bushes. Far from being anything exotic, authorities demonstrated that it was a fragment of an Italian research satellite. A police report provided greater detail, stating the unusual material was synthetic, but not explosive, weighing nearly thirty pounds, measuring a meter in length. The Italian satellite was launched in 1996 to gather data on X-rays.